The Contingent Movements Symposium will take place at the Maldives Pavilion and at the Library of Historical Archives of Contemporary Arts (ASAC) of the Venice Biennale over the 28th and 29th of September 2013. The Contingent Movements Symposium emerges from the Contingent Movements Archive, an online archival project that speculates on the contingent circumstances the low-lying island nation of the Maldives may face as global temperatures and sea levels rise. It is predicted that the country could be uninhabitable by the end of the 21st century. The Contingent Movements Symposium will unpack some problematics and possibilities of this scenario. 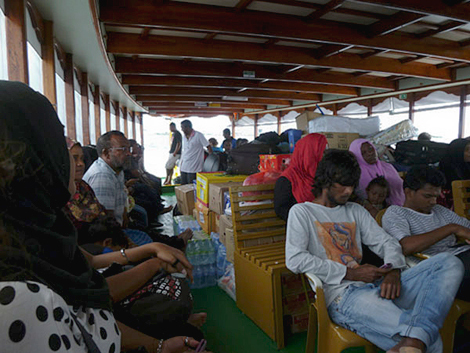 Speculating on the circumstances Maldivians may face as a permanently displaced population, and exploring these contingencies within a global context, it will address the potential humanitarian and cultural consequences of this situation. Contributors from a range of disciplines will think through the effects of national and international law on human movements, and consider how mobile technology and the Internet might assist in preserving the culture of the Maldives, while helping dispersed communities adapt and connect. Suvendrini Perera (Curtin University) challenges the island as a sign of spatial completeness as she discusses three island states – the Maldives, Sri Lanka and India – as artefacts of colonial history now cast into states of ontological, political and environmental crisis. While Mariyam Shiuna (Maldives Reseach & SOAS, University of London), through a focus on processes of democratization in the Maldives, engages with questions relating to the preservation of Maldivian culture, history and sovereignty should the nation cease to exist. Marianne Franklin (Goldsmiths, University of London) will speculate on floating digital archives as a medium for preservation and regeneration of cultural heritage. Contesting the violence of ‘unintended consequences’ of climate change, Nabil Ahmed (Goldsmiths, University of London) asks how shifting territories redefine legal and political definitions and boundaries, and whether new laws need to be imagined. Davor Vidas (Fridtjof Nansen Institute, Norway), chair of the committee on International Law and Sea-level Rise and member of the Anthropocene Working Group of the International Commission on Stratigraphy, will in turn develop on the challenges of international law in response to sea-level rise in the 21st century. T.J. Demos (University College London) will consider how various environmental crises are increasingly bringing about forced displacements, approaching discussions of political ecology, environmental crisis, and artistic and activist aesthetics in the current global moment. Having investigated the relations between location, positionality, subjectivity and arts practices in her work, Irit Rogoff (Goldsmiths, University of London) will go further to discuss recent shifts in relation to place and the exhaustion of geography. Ravi Agarval will join for discussion following a screening of his work, and Rosa Barba’s film Outwardly From Earth’s Centre will also be shown. Also in association with the Maldives Pavilion, artist Klaus Schafler and curator Maren Richter will take symposium participants on a boat trip to the lagoons of Venice, where they will discuss with Venetian urbanist and activist Stefano Boato and scientist Luca Zaggia the recent effects of the rising sea level in the region. Curator and writer Dorian Batycka and curator and theorist Mike Watson, currently in residence at the Gervasuti Foundation, will introduce the project Joan of Art: Towards a Free Education and present a course on art, politics and ecology to be delivered in November. The Contingent Movements Archive and Symposium are curated by Hanna Husberg and Laura McLean, and developed with Kalliopi Tsipni-Kolaza for the Maldives Pavilion. The Contingent Movements Symposium will start at 11 a.m with a guided tour at the Maldives Pavilion on Saturday 28th, and continue at the Historical Archives of Contemporary Arts (ASAC). 18.30 Dorian Batycka, The Crisis of In(aud)(vis)ability: Drifting in between Politics, Aesthetics and Ecology, at J Bar, Maldives Pavilion, Gervasuti Foundation. Followed by Dj Set. The Maldives Pavilion is curated by Chamber of Public Secrets, a critical production unit of art and culture, in collaboration with Gervasuti Foundation, at Fondamenta Sant’Anna (the continuation of Via Garibaldi), Castello 995, Venice, Italy. The Historical Archives of Contemporary Arts (ASAC) are accessed from Calle del Paludo Sant’Antonio (behind the Giardini area), Venice, Italy. This project has been assisted by the Australian Government through the Australia Council for the Arts, its arts funding and advisory body. It is also supported by Frame Visual Art Finland, Arts Promotion Centre Finland, and Svenska Kulturfonden, Finland. It is partnered with Maldives Research.